This song, Edelweiss, has many meanings for me. First, it is a bittersweet memory from my childhood. My adoptive parents frequently took me to local theater performances of Rodgers and Hammerstein’s musical plays. This song is from The Sound of Music. As a child, yes, this song made me sad. But now, decades later, I am struck with sentimental feelings of longing to go back into time, a time when I loved my parents with the innocence of the child I was, long before I knew the level of betrayal that my adoptive parents – and most of my adoptive family – inflicted upon me. They knew the truth of my origins and willfully kept it all a secret. I am also feeling nostalgic for the Homeland (one of many) of my German-Swiss ancestors, places I have never seen, and may never get the chance to see. I am homesick to know where my blood feels at home. And finally, I want to send this song out to my many adopted friends who were taken from their homelands and brought here to America. I have grown up: Edelweiss now is a symbol of oppression of adopted people. Earlier this morning, a dear older friend of mine slipped a note in my hand, saying that she had to leave church early but wanted to give me the note after reading the introductory papers to my memoir that I gave her last week. Please continue to call me “Joan” since that is how you know me! “Doris” is the name I had at birth, and I use it to make the point that all adoptees lose the name they were given at birth. I know it confused you, for that, I am sorry. My legal name, Joan, has been the name I’ve had for 58 of my 59 years of life. Thank you for expressing condolences for my plight in life. However, I’m not bitter. I’m bitter for what happened to me, but I am neither angry nor bitter now. My writings express it to get the points across, but no, I am quite happy. In the last 4 years, I’ve been the happiest I’ve ever been because I no longer have to interact with hateful relatives. The last two of my parents died in 2011 and with that came relief – relief that their suffering was over, and relief that the negativity of the relatives associated with my adoptive mother and with my natural father was over for me. I no longer am forced to deal with people who have been cruel to me. There are positive relatives whom I miss, some I let go because I don’t want to interact with the rest of the relatives, and others are still in my life. Believe me, there are adoptive relatives who have never treated me cruelly, and there are a few cousins from my natural mother’s family who also have not treated me with cruelty. I surround myself with positive people. I have good friends at church, at the YMCA where I exercise daily, and at various live music venues where my musician friends perform. So, the papers I gave you explaining my life were meant to share with you why I joined the United Nations Envoy Team – where you and I met last year. With my knowledge, I want to join forces with existing programs to help make the world a better place for women and children, particularly poor women and poor children, especially women persecuted for giving birth to illegitimate children, and widows and orphans. I want to stop the trafficking of poor children in international adoption and to protect our own vulnerable pregnant women and their children. Yes, I’ve lived through unbearable trauma. But being in touch with adoptees worldwide through email and Facebook on the Internet, and with mothers (and fathers) who lost their children to adoption, I am contributing to make the world a better place. I am living our UU Principles of social justice! Networking with others to foster understanding of what each of us (adoptees and parents of loss) has lived through is energizing for me. We create legislation to change laws statewide, and we write books, we appear on TV and radio to talk about our lives with the goal of raising awareness of the realities of adoption. So you see, I am not alone in writing about my life. Yes, I do see the truth in your statement: “Who knows, behind every turn, life holds treasures that you can’t foresee at the present.” In what you perceive as bitterness in my papers on my life, please keep in mind that writing these specific pieces: “About the Author” and “About the Book”, are meant to be brief highlights of what my memoir is about and a short bit of what happened to me. It all happened in the past – being transferred from one family to another, I lost my family, and my name at birth and my true birth certificate. Yes, the first years of reunion were filled with confusion and anxiety for me. But please do not believe I am not happy today. I am. It makes me happy to explain my life so that no other child – no other person – has to go through what I did. There are lessons to be learned – that is why I wrote my memoir. And as I said, it is currently being professionally edited and formatted and will be re-published this year. It’s amusing to me that you think I don’t accept the things I cannot change. See, I have been the only one doing just that: accepting all of my life. It is the rest of the people in my families (adoptive and natural) who have not dealt with the realities that created the trauma of all of our lives where my adoption is concerned. 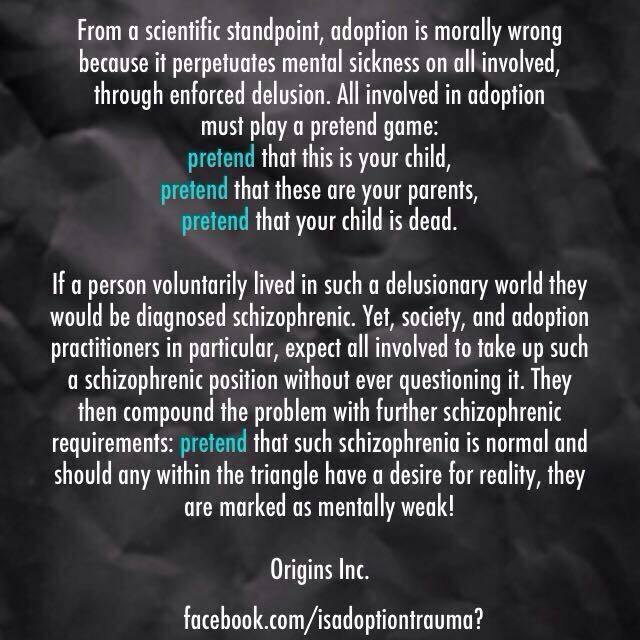 It is also the general public who does not want to hear the realities of adoption; they’d rather believe in the myths of adoption. It makes me happy to do the things I do. 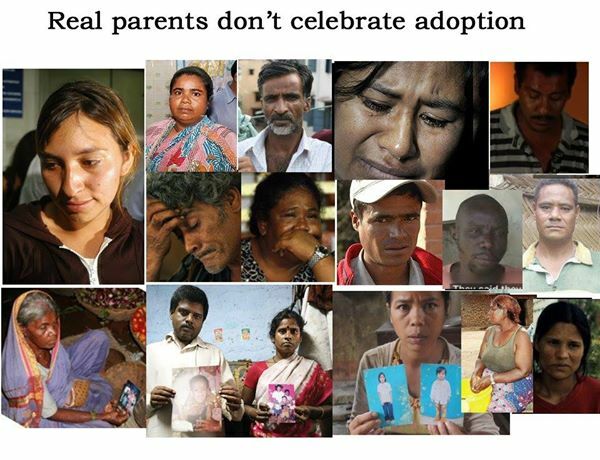 While you may not realize this, I am one of the pioneers in the field of adoption reform. I’ve been writing about adoption since 1975. I am one of about 500 to 1,000 activists around America and thousands throughout the world. It may seem to you that I am not happy since my story is tragic. I am, in fact, very happy inside myself, knowing that I am trying to change what I can to make this a better world.